"In a world where people born with an extreme skill-called a Grace-are feared and exploited, Katsa carries the burden of a skill even she despises: the Grace of killing. She lives under the command of her uncle Randa, King of the Middluns, and is expected to execute his dirty work, punishing and torturing anyone who displeases him. She never expects to learn a new truth about her own Grace--or about a terrible secret that lies hidden far away... a secret that could destroy all seven kingdoms with words alone." I started Graceling with mediocre expectations. Many people love this book but many people hate this book. So I wasn't surprised when I started reading and didn't really like it that much. The beginning of the story was confusing. There wasn't much world building and somewhere during Chapter two all the information about the world the story takes place in was dumped all at once and it was a lot to take in. The confusion didn't stop until about page 50. Then I got more into the story. Once I actually understood what was going on, I started to really like the book. The idea of being born with an extreme skill is unique and seeing characters living with the Grace made the book even better. The main character, Katsa, is graced with killing which makes it sound like she would be a strong female protagonist, right? While she was definitely strong physically, she thought very low things of herself and that was sometimes hard to read. ...And she had a raging female agenda. Katsa wan't a completely bad character though. There was definitely some character development and by the end of the story she was not only more comfortable with herself but with others as well. The other main character, Po, was such a wonderful person! He balanced out Katsa's more violent personality with his wise, kind, and empathetic personality. He helped Katsa develop as a character which was great to see. He actually developed as a character. Once he became comfortable with his grace he was more comfortable with himself. There is a "romance" between Katsa and Po but it plays a small part in the story compared to the bigger things happening that are causing a conflict. As far as the story itself, there was enough action that I wanted to continue reading when I got to the end of each chapter, but not to a point where I would call this book a "page-turner." I would recommend Graceling to anyone who enjoys Throne of Glass by: Sarah J. Maas. Or to anyone who enjoys strong female protagonists who can fight for themselves. 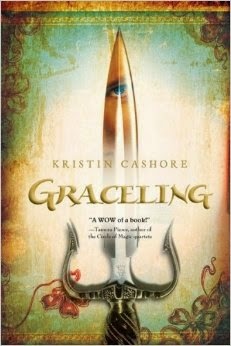 What were your thoughts on Graceling?